There are many clichés in motorcycle journalism. Some of them are outdated, some are simply nonsense. But there’s one which, though massively overused not just by us lot but by pub “experts” everywhere that is so very true. And until today, in thirty five years of riding, I’d never really tried it. 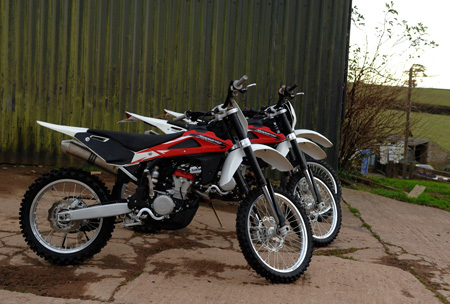 Off road riding massively improves your on road skills. It also makes you ache in places you didn’t know could ache. In fact, sitting here writing after the first day of a two day course, I can honestly say I’m aching in places I didn’t even know I had. But I’ve also had more fun on a motorbike that I can remember having had in a very long time. I’m at Wheeldon Offroad Centre near Totnes in Devon. They have the only permanent indoor motorcross training facility in Europe, as well as a very challenging outdoor track and miles upon miles of green lanes and trails on which to practice your new-found skills. Better yet, they have a wide range of Alpinestars kit, decent helmets and 2012 model Husqvarna bikes, the loan of all which is included in the price. And last but not least they have comfortable on site accommodation, excellent catering and a lovely warm swimming pool. Trust me – you’ll appreciate the pool more than you might expect. Before I launch into the review properly, allow me to provide some background information. I’ve been riding motorbikes for thirty five years, as near as makes no difference. 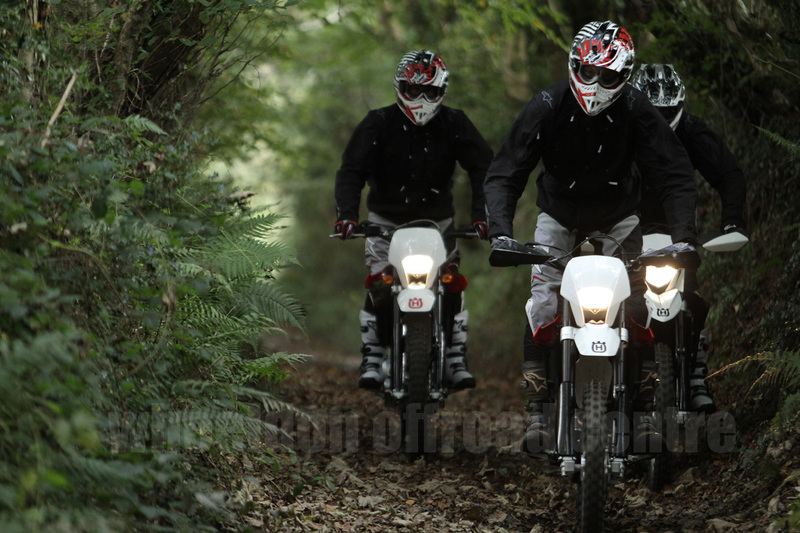 In all that time, for one reason or another, I’ve never really had the chance – or perhaps I’ve never taken the chances I have had – to ride off road. Which probably doesn’t make me terribly unusual, but does put me in a pretty good position to make an assessment of how good the course is. There’s nothing wrong with my bike control, I know that, and as a road rider I’m informed that I’m quite good. Well, we’ll have to see, won’t we. The course starts with a briefing and the issue of all your kit. The Wheeldon team, Andy and Jim who own the centre plus Mark and Tracie who work with them, don’t like getting hurt because they didn’t wear the right kit. And not unreasonably they assume that their customers will feel the same. So you get issued with knee, shin, elbow and forearm armour from Alpinestars, along with top-end boots, gloves and the obligatory lairy coloured trousers and shirt from the same company. Gloves and body armour have similar provenance, while decent helmets and seriously top-end goggles complete the ensemble. By the time I was kitted up, even if I rode like a pansy I felt I at least looked the part, and that’s got to count for something, right? Dinner was an opportunity to get to know the other participants and have a laugh. It was also time to meet our chief instructor – one Troy Corser Esq, twice World Superbike champion who started his competition career at the age of ten winning motocross championships in Australia. Troy has now retired from SBK, and while he still has a full time job as an ambassador for BMW, there’s time for him to do this every now and again as well. The next day started early with a hearty breakfast before a half hour session in the gym with Troy. The idea was to get warmed up before the serious workout started, as well as to learn some potentially useful fitness tips. And you know what? I picked up some new exercises which seem to work well for me and also got some valuable pointers on technique for some of the other exercise I already do. Troy’s trainer from his racing days believed that it was better to do an exercise right half a dozen times than wrongly a hundred times, and the difference you feel when you get it right suggests he was right. So an hour into the course and I’m learning things that have genuinely made a difference to me. Crikey. 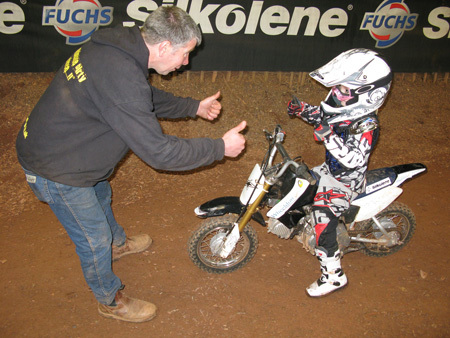 Then it was off to get acquainted with our bikes and have a look at the indoor arena. 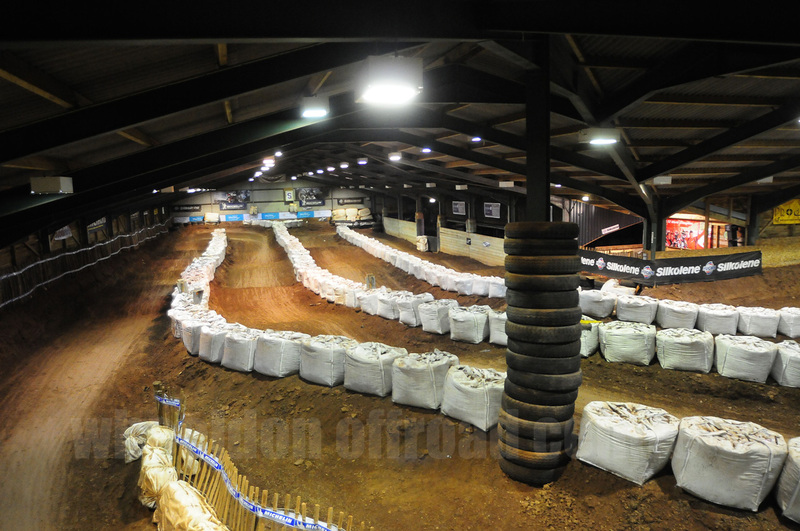 There are two specific indoor tracks, a junior track which is level and is broadly square with a smaller bank in the middle. Think of a squared off figure of eight, where you can ride all the way round the outside or take a sharper turn to go up and down the inside part as well. This means that less experienced off road riders can have the opportunity to ride on a relatively consistent surface before going out into the big bad full track, more of which later. 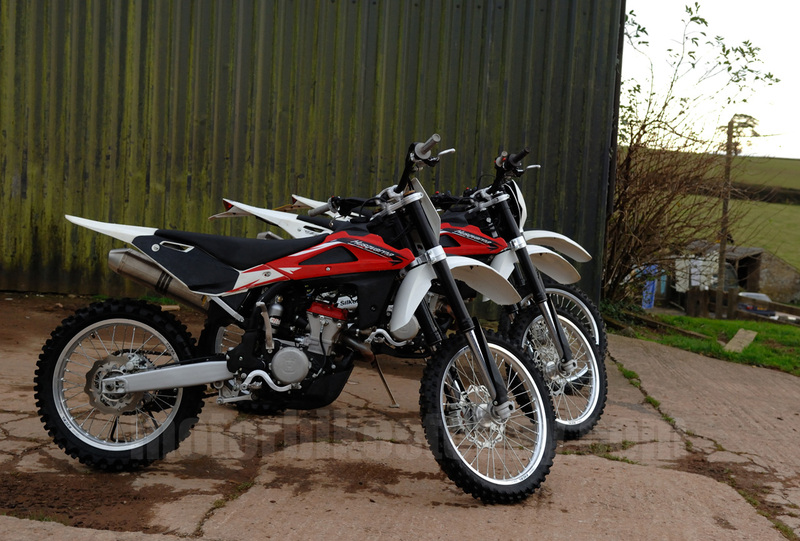 For now, the three of us who were real offroad virgins were given a nice shiny Husqvarna TE125, a former SBK champion and a junior track to play with. Troy had us each ride a couple of full laps before then getting in the way and making us go up the inner circuit as well, causing the corners to be much tighter. Looking back now I can’t believe how intimidating that was. Though the surface is relatively smooth and consistent, the bike still moves around quite a lot and if you’re not used to that sort of thing it’s a bit odd. Plus I’m used to turning by leaning a lot rather than moving the bars, and putting my foot out as support is totally alien. But five minutes or so there for each of us gave us the basics we needed to go out on the proper track. The proper track. Ah yes, Imagine a barn. A proper, fullsized dairy farm type barn. Because that’s what it is. An L shaped barn about a hundred and fifty feet across and two hundred and something feet long. It’s not small. It’s also full of quite a lot of prime Devonshire soil, clay, rocks and the other things needed to make a motocross track. The circuit itself is quite tight but still has one full throttle straight and a couple of seriously fast bends as well as the obligatory tabletop, a couple of jumps and some good tight corners in which to practice your technique. Now by this stage I was properly apprehensive because, though I hadn’t had a problem other than being slow and hesitant on the kiddie track, I’m not used to being slow and hesitant, and now I was going to be mixing with other people as well. First of all, the track is enormous. There’s plenty of room not to get in anyone’s way. Secondly, the instruction received was timely and sessions were short enough that you could get some advice before problems arose. 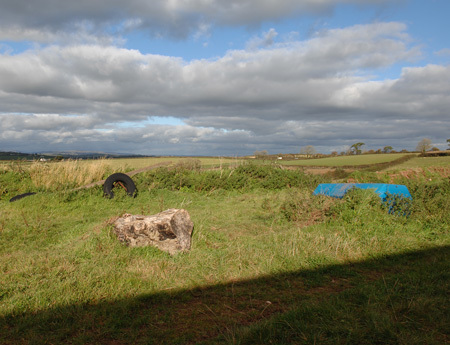 There’s also a strong likelihood of finding an instructor (Troy in our case, but Jim or Andy would have done the job as well) standing on a haybale inside a corner and yelling advice at you as you wobble past. And finally, there’s likely to be at least one person on the track who knows what they’re doing. Picture the scene. On my second lap, just getting used to the fact that the bike moves around quite a lot but I don’t necessarily fall off, I’m going around corners by slowing right down and turning the bars, gingerly opening the throttle on the way out and clenching my backside in anticipation of a slide. Then Chris, one of the others in my group (mistakenly, because he’s way, way better than the rest of us) comes past me on the way into a corner and simply uses the bank on the edge of the track (which I now know is called a berm) like banking on a road circuit and goes around about three times faster than me. Not only that but he’s hard on the throttle as he leaves and all is fine. Now he’s a better offroad rider than me but the laws of physics are the same for all of us. He didn’t fall off so I tried it as well. Bingo – that’s the way to do it! At the end of the session Andy says “I notice you’re using the berms. That’s good” and then proceeds to give me a couple of really easy to digest pointers as to how to use them better. Next session I saw someone stick their foot out and use it as a pivot/support for cornering tighter without using the berm. I tried that, too, and a couple of laps later had got it vaguely sussed. And so it went on. The three of us that were genuinely not experienced progressed faster than I would have believed possible. By halfway through the morning I was on a 250 rather than a 125 and felt completely at home. While I’m certainly not about to claim being a motocross expert, I was certainly going much faster and riding with commitment. The break for lunch was welcome, not because we weren’t having fun, but because it was physically very hard work. Because of the way the sessions are structured, everyone was riding with an audience so there was lots of comment from all of us, not just the instructors, and the atmosphere was enthusiastic and friendly with constructive comment the order of the day. Back for more in the afternoon, again getting faster and more competent, with an added feature. It was the plan to go trail riding the next day, and conditions would be different. In case you’re not familiar with the UK, this summer has been a little damp. And Autumn has been damper. 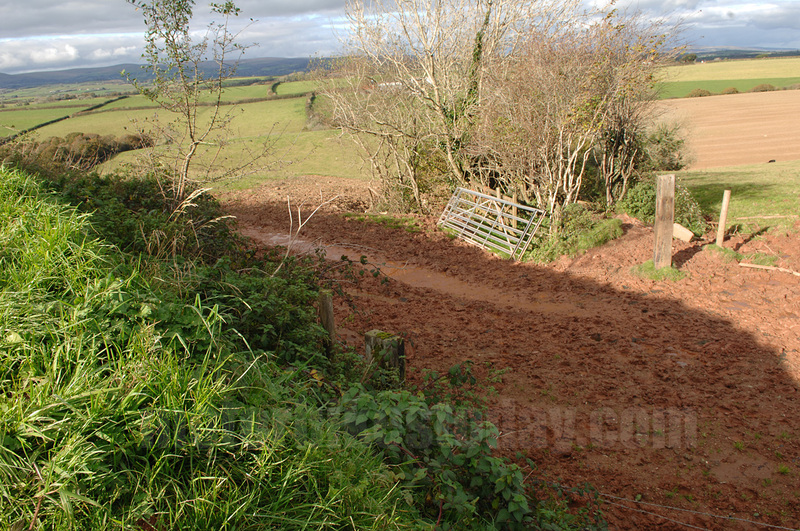 Devon, in particular, has experienced flooding in places and bizarrely it had snowed the week before we were there. In October. There’s an outdoor circuit at Wheeldon as well, and Troy wanted to take each of us there for a one to one session before we were confronted with the outside world. Seemed like a good idea at the time. Except that the circuit resembled the Somme after a week’s barrage. Deep, slick, sticky red mud. Did I say sticky? I meant as slippery as soap. And sticky. Riding down there was a challenge in itself. Not technically, but mentally. Because to get onto the track you needed to ride down a small cliff. I mean small – probably only a couple of feet – but I mean a cliff as well. 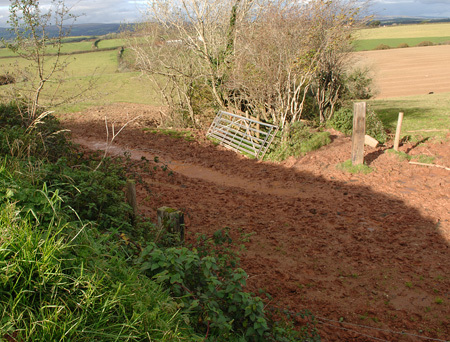 A vertical drop from a grassy slope to a muddy track. Troy just went straight down it, and it was a real leap of faith to do the same thing. Then we were on the track, and it was simply a case of following Troy. Or not. I got half way around and was starting to think it was OK when I fell off the first time, taking a berm the same way as I had indoors but simply sliding up it. Everything would have been fine had I not then bottled out and shut the throttle, at which point the mud took over and the 310 engine simply stalled and the bike fell over. Apparently it was quite graceful but annoying. The next time wasn’t completely my fault, as there are cows in the field and they got in the way. Well, that’s my excuse, anyway. Then I stalled the bike and couldn’t restart it. Then I got cross rutted and ended up in a hedge. Down a bank. 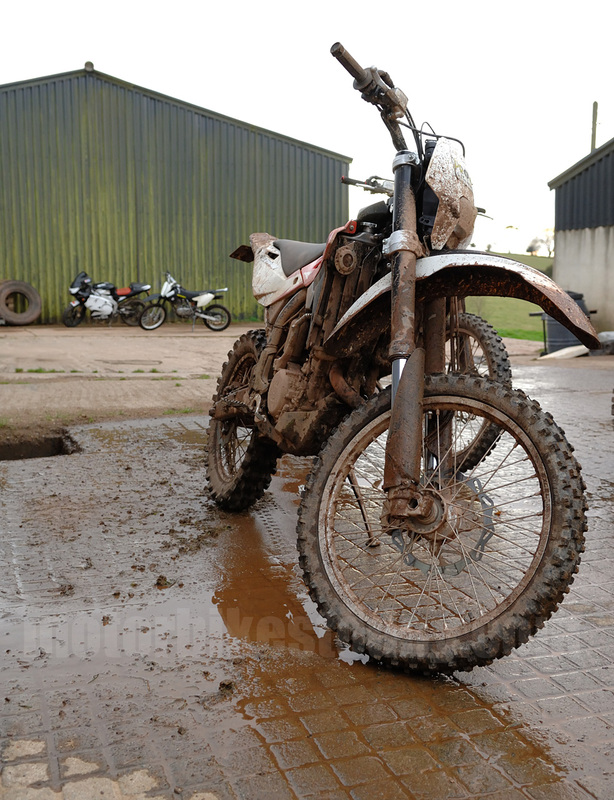 At least it was dry there, but Troy had to get the bike out while I stood there feeling foolish. The rest of the session went OK, and we got back to the barn without further disaster. In fact after that I thought it went quite well. But I was a little nervous about what was to come tomorrow, so attacked the indoor track with renewed gusto to make myself feel better. 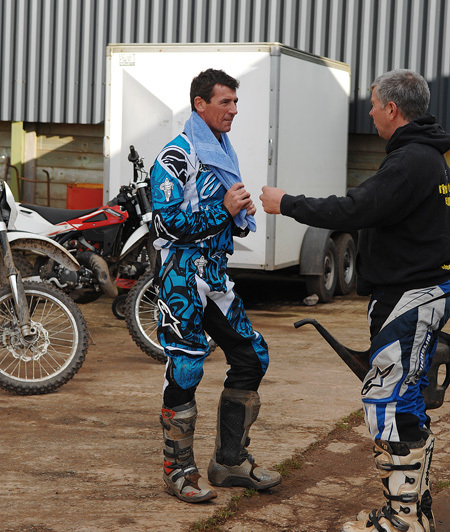 And I was doing pretty well, too, even getting respectable airtime off the jumps and really going quite fast, but Jim and Andy are good at spotting when people are getting to the end of their endurance and they pulled me off the track after a rather scrappy lap. Then I realised just how shattered I was, and how glad I was to stop. Everyone else finished at the same time, and a swim in their lovely hot pool followed by a hearty dinner saw me writing the introduction to this article. I then fell into bed and died for six hours or so. I woke to the sound of rain. Torrential rain. So I went back to sleep. Three hours later the alarm went off and I dragged my poor battered aching body out of bed. Actually I didn’t hurt as much as I expected. And not only had the rain stopped but the sun was shining. A hearty breakfast again, followed by another half hour in the gym to warm up, including the chance to try some exercises that I’ve never done before. I always thought balance balls – those big soft inflatables you see in the gym - were mainly for the ladies but kneeling on them and moving around works your core muscles as you get back to your centre of balance. Troy stands on it and does weights at the same time, but he’s a bit special like that. Another short briefing, this time about the routine for riding on the road, a check that we all had appropriate licences and we got our jackets (Alpinestars, of course) issued for the trail rides. 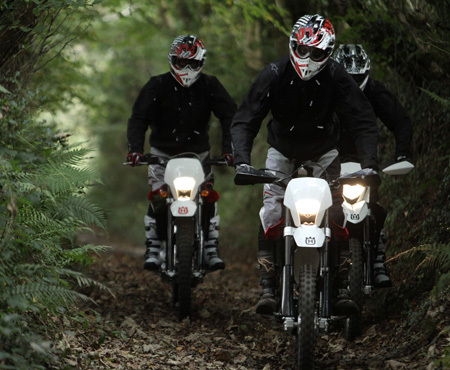 There’s a good reason for taking a TE250 Husqvarna on a trail ride. Well, there are several good reasons, not least that it’s a bloody good bike, but the best reason of all is that it has an electric start. Something I’d come to appreciate several times during the day. The next section went downhill, so it was better drained and consequently far easier. Or it would have been had half the trail not been washed away leaving a gully a couple of feet deep. I rode the whole trail chanting “Look where you want to go, look where you want to go” inside my helmet. I suspect the others were doing the same, because nobody fell into the centre of the earth or crashed into the pools of molten lava that I’m sure would have been there if I’d looked hard enough. A short break and a short road ride later and we stopped for tea at a garden centre before tackling the next bit. I introduced myself to this by stalling my bike. Twice. Happily I have used a kickstart before, because when they’re hot (and they do get very hot) the 250s don’t especially like being started on the button. They’re easy enough to kick, anyway, provided you stay calm. This segment had a combination of everything. Mud, grass, uphill, downhill. I got cross rutted on the way up one of the hills in mud and smacked the bank with the front of the bike. No damage done and we stayed upright but I stalled again and of course the couple of riders behind me had to stop as well because I blocked the trail. I hauled the bike out of the way so they could get past, kicked it into life and managed to get moving again and make it to the top with no further drama. For a variety of reasons, at this point our five became three as one of the participants had had enough so was escorted back to the centre by our second instructor. Which just left Jim looking after two of us. Who are both pilots and former racers. This had the potential to get messy. With a smaller group we went quicker and the sections strung together better. I can’t actually tell you what happened when, just that the trail riding part of the day ended with a long, fiendishly slippery climb with occasional grippy bits that just meant that the next time it got slippery we were going faster. And it was bloody fast too. Certainly fast enough that I really, really didn’t want to crash because I suspected that it would hurt. The only time it went wrong was down to my overcontrolling – what’s known in flying as Pilot Induced Oscillation, when the bike starts to slide left so you overcorrect and slide right which you overcorrect and slide left and so on until eventually you crash. There’s only two ways out of it, and I took the easy way and simply stopped, regrouped and started again. Not ideal, especially on a hill, but at least I didn’t have to pick myself up off the ground, lift the bike and get it going again. The funny thing is that the one time I looked at the speedo while flying up the hill I was still only doing about forty miles per hour. It felt like a hundred and forty. In a spectacular piece of timing we arrived back at Wheeldon just in time to remove our boots and tuck in to a delicious home made lasagne. Did I mention that catering here is first class? After lunch came a totally different challenge. Three of us back on TE125s and Troy Corser showing us how to do stuff. First thing was riding up proper hills. 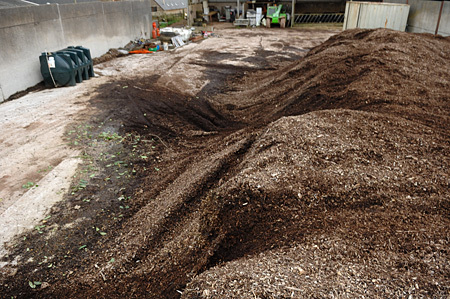 The proper hill in this case was a six foot pile of wood chips. A very, very big pile. Troy demonstrated how to get up a few times, as well as how to come back down, and we all gave it a go. Then it got progressively harder until eventually, one at a time, we were following him up nearly sheer climbs, turning around at the top and coming down equally steep drops. The technique is actually quite straightforward, it’s just the leap of faith required to ride off a near-vertical drop with concrete underneath. From woodchips we progressed to grass, then combinations of obstacles. Now I was feeling pretty good at this point. I’d got it all sussed and hadn’t had any problems at all – I’d seen Troy do everything and trusted that he wasn’t about to kill me so I’d been able to stay with him. But now it all went to pot. The first challenge was a barrel, and I really struggled going over it. Then, when I got it nailed, we went straight to the barrel followed by a log. And I spent a lot of time picking my bike up and restarting it while being encouraged, coached and gently laughed at in equal measures. Then it was over. We finished up with half an hour or so in the indoor circuit, first of all riding round the wrong way to see how different it was, staying slow and using the skills we’d learned over the last couple of days and then finally half a dozen laps at speed the proper way. The difference was astounding, and the level of confidence we all had was testament to the excellent instruction. I used to joke that the only time I went off road was when I hadn’t made a corner. Well after this course, not only would I now cheerfully embrace the opportunity to get filthy, I might actually be able to apply some of the things I’d learned to get me around that corner in the first place. Because these skills genuinely are transferrable to road riding. Now I know that if my bike moves under me it isn’t the end of the world. I’ve learned so much about the finesse of machine control at the edge of grip. It’s not something I can really put into words, but the difference it has made to my road riding, especially on the nasty greasy roads we are currently enjoying, is immeasurable. I’m faster, safer and enjoying myself more. And that makes the course impossibly good value. If you have the chance to do this course, take it. You will not be sorry. Oh, and it doesn’t matter if you’ve never ridden before or even are too young to ride. Obviously the trail riding is out but the rest of it is still up for grabs, and what better way to get started on a bike than by developing some serious machine control skills in a controlled environment…and having a ball at the same time? 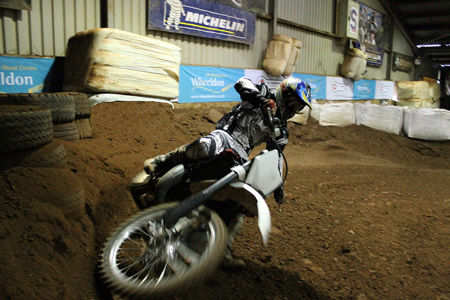 Thanks to Wheeldon Off Road Centre for the most fun I’ve ever had on a motorbike.